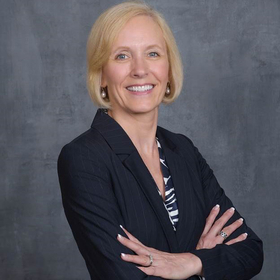 Roxanna Gapstur will succeed Dr. Kevin Mosser as the next president and CEO of WellSpan Health after Mosser retires on Jan. 1, the integrated health system announced Monday. Gapstur is president of Methodist Hospital in St. Louis Park, Minn., and senior vice president of HealthPartners, a $7.2 billion, Minnesota-based integrated health system that includes eight hospitals, 1,800 employed physicians and more than 100 care locations. "Roxanna comes to WellSpan and central Pennsylvania with a wealth of leadership experience in a large, complex healthcare organization that has experienced significant change and growth," WellSpan board Chairman Steven Hovis said in a statement. "She also possesses an extensive background in the nursing profession, which aligns with WellSpan's history of strong clinical leadership." Gapstur has helped HealthPartners expand through a merger with Hutchinson Area Health Care, now Hutchinson Health, as well as post-acute partnerships. York, Pa.-based WellSpan, a six-hospital, not-for-profit system, is currently exploring a potential merger with Summit Health and its two hospitals. WellSpan also includes more than 1,200 physicians and advanced practice clinicians, a regional behavioral health organization, a home care organization, more than 15,000 employees and more than 140 patient care locations. Gapstur has a bachelor's degree in nursing from the College of St. Catherine, a master's in nursing from the University of Minnesota and a doctorate in nursing from the University of Minnesota.